The Border Security Force (BSF) is a Border Guarding Force of India. Established on December 1, 1965, it is a paramilitary force charged with guarding India's land border during peace time and preventing transnational crime. It is a Union Government Agency under the administrative control of Ministry of Home Affairs. It is one of many law enforcement agency of India.It currently stands as the world's largest border guarding force. Age: Between 20 to 25 years. Qualification: Bachelor’s degree in Mechanical Engineering OR 03yrs Diploma in Mechanical or Marine or Automobile Engineering. Qualification: 10+2 or its equivalent and Second class Master certificate issued by the Central or State Inland Water Transports Authority or Mercantile Marine Deptt. Qualification: 10+2 or its equivalent and First Class Engine Driver certificate issued by Central or State Inland Water Transports Authority or Mercantile Marine Depth. Qualification: Matriculation and ITI Diploma in Motor Mechanic (Diesel/ Petrol Engine), Machinist/ Welder/ Capentry/ Electrician/ Fitter/ Air Conditioner Technician/ Electronics/ Plumbing/ Upholstering/ Painting. Selection: Candidates will be selected through written exam qualified candidates will called for next phases of PST/ PET, interview and medical examination. 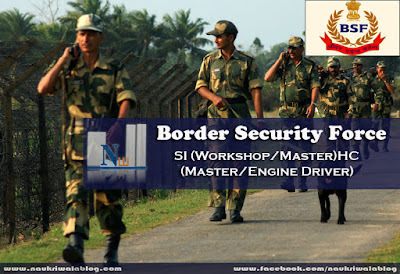 How to Apply: The completed application in the prescribed format along with all relevant documents must reach "The Directorate General Border Security Force, New Delhi".